On Tuesday, Apple (AAPL, Tech30) unveiled new smartwatches, an Apple TV and the iPhone 8 and 8 Plus at a press event. But the showstopper was a premium device called iPhone X, with a starting price that would have once seemed laughable for a phone: $999. Here are 10 things you should know about iPhone X. For starters, the new phone is pronounced “ten,” not “X,” at least according to Apple executives speaking about it on stage. The iPhone X will have glass on both the front and the back, creating what Apple calls an “all-glass design.” In case you’re worried about that glass breaking, Apple stresses that the glass is “the most durable” ever used in a smartphone. The front of the iPhone is all screen. Literally. The display covers the full face of the device, with the exception of a small sliver at the top for the camera. The screen measures 5.8-inches diagonally. The secret to getting that full bleed screen is doing away with the home button. Instead, users can swipe up from the bottom of the screen to return to the home screen or toggle between apps. Apple’s other iPhones let you unlock the devices and many apps with your finger print. The iPhone X is offering something different: the ability to unlock by scanning and recognizing your face. To accomplish this, Apple is using a new camera system that relies on infrared, a dot projector and neural networks to create a mathematical model of faces. This model “adapts to you as your face changes overtime,” according to Schiller. Have you been feeling a hole in your heart because you can’t send an animated panda emoji with your voice and facial gestures? Us neither, but soon you’ll be able to anyway with the new animoji feature on iPhone X. 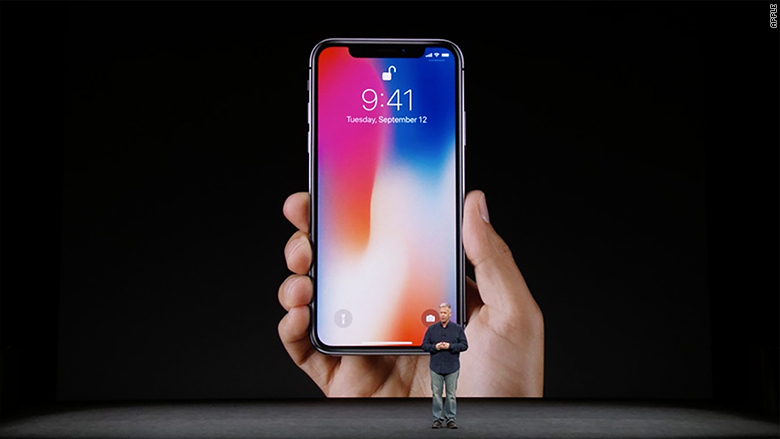 The iPhone X comes in just two colors: silver and space gray. The iPhone 8 and 8 Plus offer those same colors as well as gold. The iPhone X, like the 8 and 8 Plus, will have wireless charging. It’s based on Qi wireless charging, which Apple expects to be available at a wide range of public venues in the not too distant future. There is a notable delay. While the iPhone 8 and 8 Plus will go on sale this month, the iPhone X won’t be available for pre-order until October 27. It is expected to begin shipping by November 3. This 20 Year Old Just Built a 6-Figure Business Online. What’s Your Excuse?